AUCKLAND, New Zealand - Auckland City FC welcomed Nogometni Klub Bravo club president Darko Klarič and his son Blaz to its Kiwitea Street base last night as the Navy Blues international relations drive continued. The Klarič family are on a two week mission to develop international relations on behalf of their Slovenian club with Auckland their latest stop. "We're doing a trip around the world and when we departed Hawaii for New Zealand I started searching football clubs here and I stumb led across Auckland City FC. Nogometni Klub Bravo is focused on developing young footballers while the first team plays in the second tier of the Slovenian professional set-up. The club's U-19 team reached the national cup final and has won two national age-group titles at U-15 and U-13 categories. Klarič says Slovenian football is in a good position to go to the next level. "Our national team is doing well in the FIFA World Cup qualifiers and have a chance of reaching Russia next year. We're in a group with England, Slovakia, Scotland, Malta and Lithuania and sit in third place with four games to go. "Slovenian club football is doing well. We have four teams in the European club competitions and three of them have advanced to further rounds. "Even our coach situation is good with the head coach of Croatian champions HNK Rijeka, Damir Mišković, from Slovenia. He was also our national team coach who managed to get Slovenia qualified for the FIFA World Cup South Africa 2010," Klarič said. Klarič visit also has a strong Kiwitea Street tie with former Central United and Auckland City FC youth player and New Zealand U-20 international Adam Mitchell signing with Slovenian outfit NK Celje in February. "I intend to visit Adam Mitchell when we return to Slovenia and hopefully we can update everyone connected with the Navy Blues how Adam is doing," he said. While Klarič has enjoyed his visit to New Zealand he is most impressed by what Auckland City FC has achieved on the world stage with modest resource. Its a dream Klarič realised in his other passion - rally driving. "For an amateur club to qualify for the FIFA Club World Cup and to compete with professional opponents is impressive and I can relate to this underdog story in my own life. "Growing up I always wished to be a professional rally driver and compete at the highest level but I came from a poor background and could not afford the car parts or opportunities required to realise this dream. "I became an instructor to the drivers and this allowed me to be part of the sport. I made myself a promise that if ever I was in a position to help others reach their goals then I would do all I could. "This is a noble cause and I founded our football club with these values in mind. We want to provide young footballers with the best possible opportunities, to develop their skills and to grow them both as footballers and people," he said. While talks with Klarič were informal neither party ruled out working together on future possibilities. "You must never say never. It always depends on the people involved and trust between both parties. You never know perhaps we can find possibilities for both sides in the future," he said. The early signs for the Auckland City FC-Nogometni Klub Bravo relationship are good with Klarič's initial impressions of New Zealand itself positive. Apart from the Klarič's football mission they've had some time to add a few tourist activities to their whistle-stop itinerary. "New Zealand is a bit similar to Slovenia in terms of its climate and geography. Its a young country with a very recent modern history with many possibilities before it. "I always hear many things about countries but I always believe in seeing things for yourself to generate my own impression and so far everything has been very positive. "We're only here for four days in New Zealand but our world trip is two weeks. We wanted to visit Auckland and its surrounding areas and get to know the city. "We've visited the countryside and also went to Hobbiton in Matamata. We have a day tour then we head off to Japan to further our football mission," he said. Klarič's final comments turned towards the achievements of his hosts and again reflected his personal and professional values. "Auckland City FC should be very proud of what they have achieved in the past but at the same time never be satisfied with what you have and always look to improve and move forward and look for new synergies. "Working together to achieve the next level is vital in all aspects of sport and international relations," Klarič said. 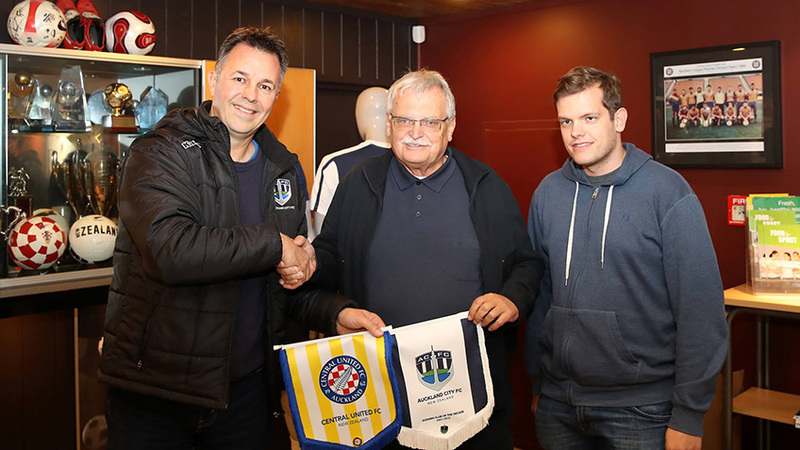 Auckland City FC club representative Mitch Herceg said Klarič's visit was a special occasion. The club presented both visitors with replica kits from Auckland City FC and Central United along with pin badges, scarves and pennants. "We pride ourselves on being an open, hospitable, club and to receive Darko Klarič and his son Blaz is an honour for all of us. "Auckland City FC is always looking to further enhance its reputation and with Adam Mitchell a link between our two footballing nations we're sure we'll keep speaking with Darko into the future," Herceg said.